TaxCalc Companies House Forms saves time keeping Companies House up to date by filing forms securely online from within TaxCalc. The software features a library of the most commonly used forms, including managing officers and shareholders, and the annual Confirmation Statement (replacement for the Annual Return). As with all TaxCalc products, the software is built around SimpleStep® workflows, one for each form, meaning all necessary information is collected in a methodical manner to ensure successful filing. TaxCalc Companies House Forms is sold on an annual licence basis. 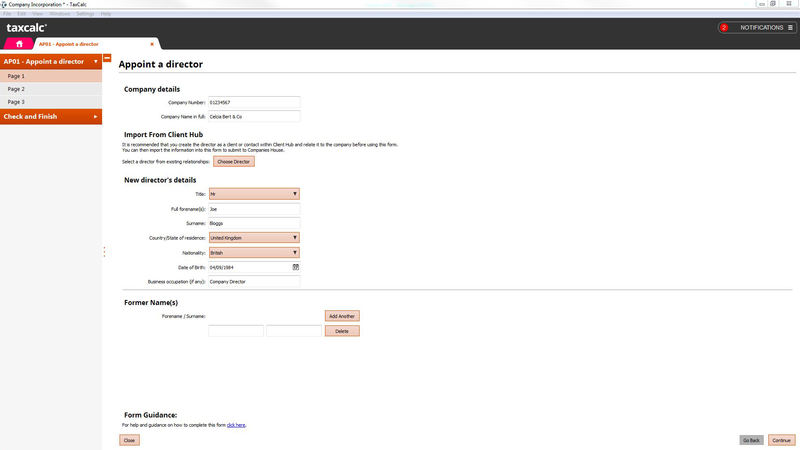 Usage is allocated to each client as you create forms for them. There are no additional user charges. To file forms and pay the Confirmation Statement filing fee on behalf of your clients, you will need to set up a credit account with Companies House. "There's a form for that..."
Our software caters for two approaches of working. The first is to complete a form, which, at point of submission to Companies House, will automatically update client records. The second approach is that the software helpfully recommends the creation of forms when certain changes are made to client data. 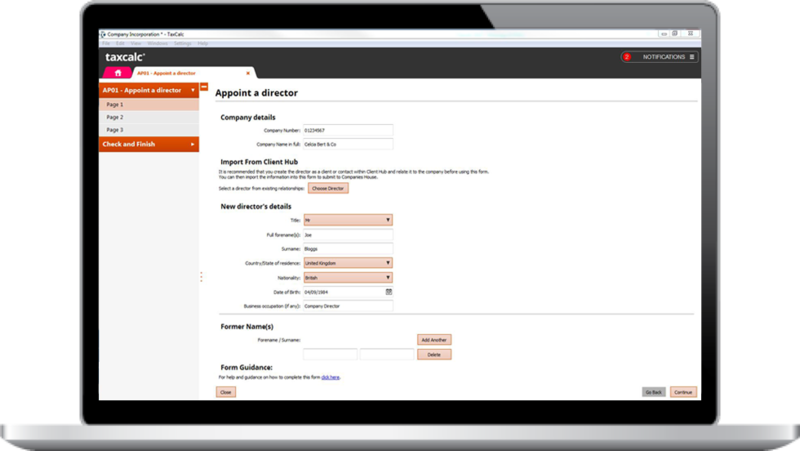 For example, if you appoint a director from within Accounts Production, TaxCalc will recommend the creation of a form. All of TaxCalc's products are designed to integrate and share data. TaxCalc Companies House Forms is no different. 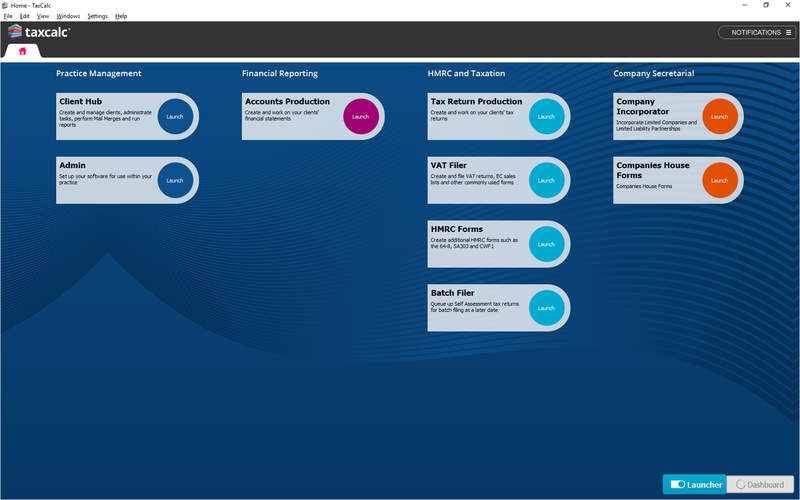 To facilitate the maintenance of Companies House records, TaxCalc Client Hub has been updated to include share classes, shareholders, Persons of Significant Control and more. 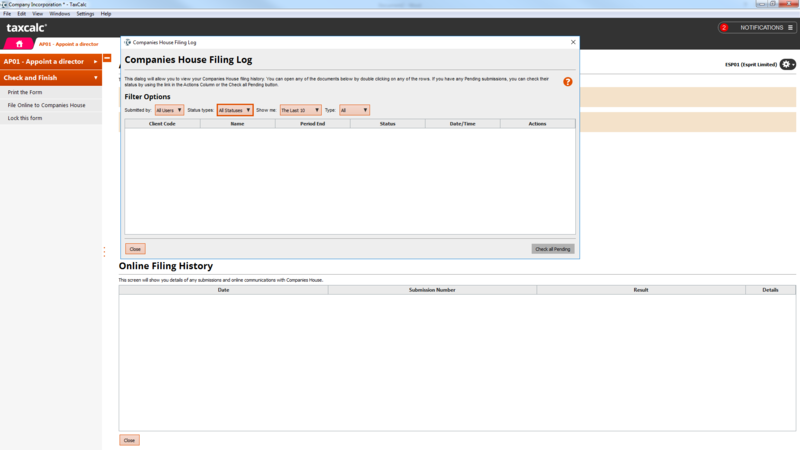 Data is shared between TaxCalc Companies House Forms and TaxCalc Client Hub and vice versa. requirements with Companies House up to date. Whether you're just starting out or are an established firm, we have package sizes to suit – micro, small and unlimited clients. As with all TaxCalc products, data is captured through a SimpleStep process. Data is prepopulated with data from TaxCalc Client Hub. Prior to filing, whether by paper or online, TaxCalc's Check & Finish process will validate entries made and ensure a successful filing to Companies House. 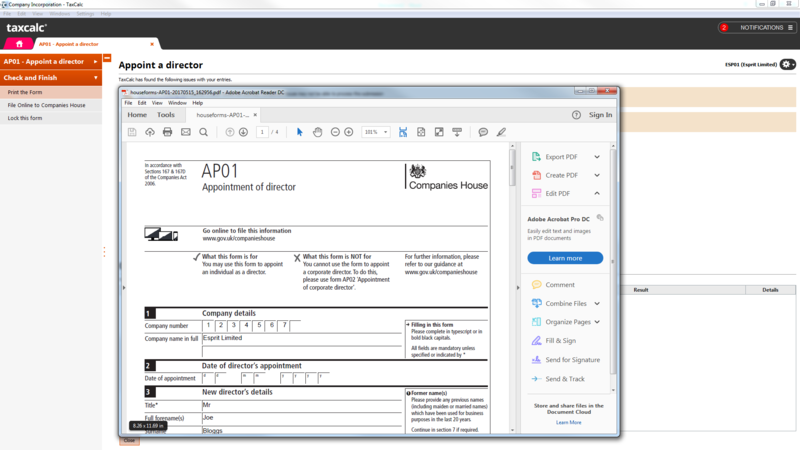 When you activate TaxCalc Companies House Forms, you'll find your other TaxCalc software will make recommendations for form creation to help you keep client's affairs up to date. Many forms require a Companies House member of staff to review and confirm its acceptance. Accordingly, TaxCalc tracks processing and will confirm when the form has been accepted. Keep client records up to date with new fields in TaxCalc Client Hub: director digital signatures, share classes, shareholder activities (issue, transfer etc.) and persons of significant control. Every year, we update our software products with features that can really make a difference. For existing customers, this page sets out all you need to know. Collecting and maintaining client data can be a long and boring task, but now on-boarding new Limited Company clients is a quick and simple process. 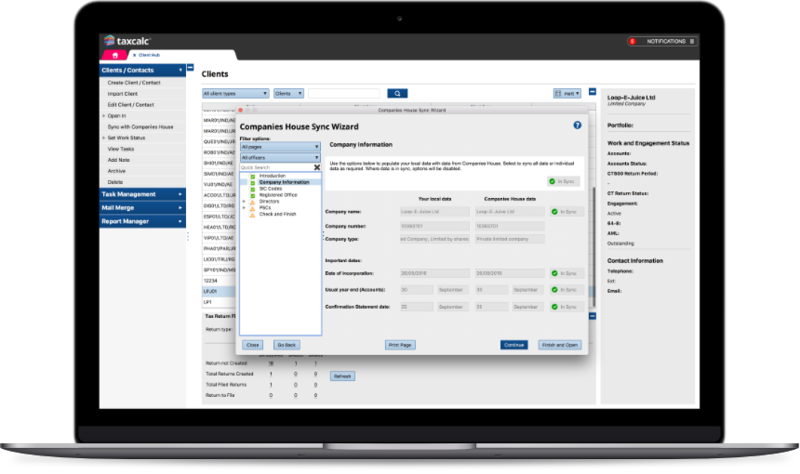 Using our ingenious Sync Wizard, Companies House Advanced Integration lets you check and pull even more information from the Public Register directly into Client Hub. From now on you’ll always be sure your local data and the data held on public record is accurate and up to date at any time. *This add-on is included with Companies House Forms Unlimited. You can create a form to complete in two ways. 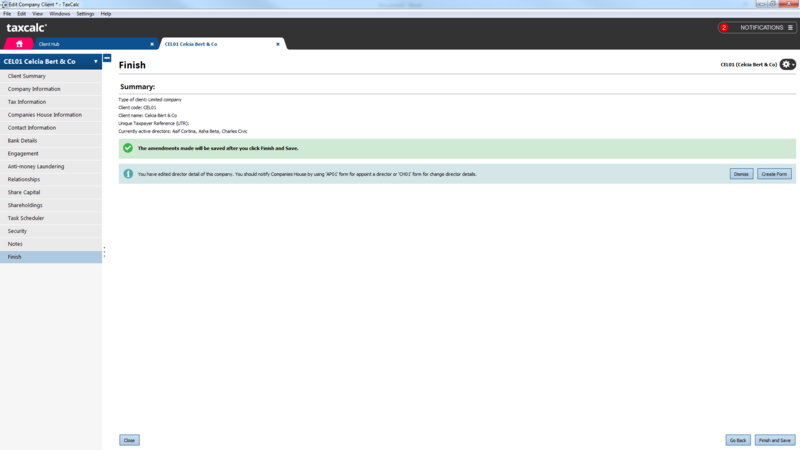 The first is by clicking on the icon on the TaxCalc Hub Home tab. Alternatively, as you use TaxCalc, the software will suggest to you forms that you may wish to file. … and the Check & Finish process at the end validates your entries to ensure a successful submission to Companies House. Each form has a paper version for clients to authorise and most can be submitted by post. Alternatively, you can file online. For forms filed online, you can track the progress of the submissions and confirm Companies House acceptance. The questions below provide immediate answers to many aspects of TaxClient Client Hub. Does TaxCalc work on Windows 10? We recommend that practitioners that wish to run their practices on Apple Macs consider TaxCalc CloudConnect. Under this service, we look after your data in the Cloud meaning any computer with an Internet connection can connect to it. To find out more about TaxCalc CloudConnect, please visit our dedicated TaxCalc CloudConnect web pages or call our sales team on 0345 5190 882. Not yet but we have a plan to release an update in the autumn of 2017 to include these forms. Yes, TaxCalc Companies House Forms includes the capability to file online Confirmation Statements (CS01). No. To file the forms in TaxCalc Companies House Forms and to pay the Confirmation Statement filing fee on behalf of your clients, you will need to set up a credit account with Companies House. You can also use this account to file company accounts in TaxCalc Accounts Production and to incorporate companies in TaxCalc Company Incorporator. No. Unlike some software providers, you do not need this software to file company accounts. In fact, we designed TaxCalc Accounts Production to file accounts directly to Companies House as one of its key features. The software is licensed on an annual basis for 12, 50 or unlimited clients. Whenever you create a form for a client, you will allocate one of your client licences to it. The number of clients allocated to your licence is reset in each licence period, which means that when different clients need forms filing in the second year, you do not need to continue to pay for those you represented in the first. 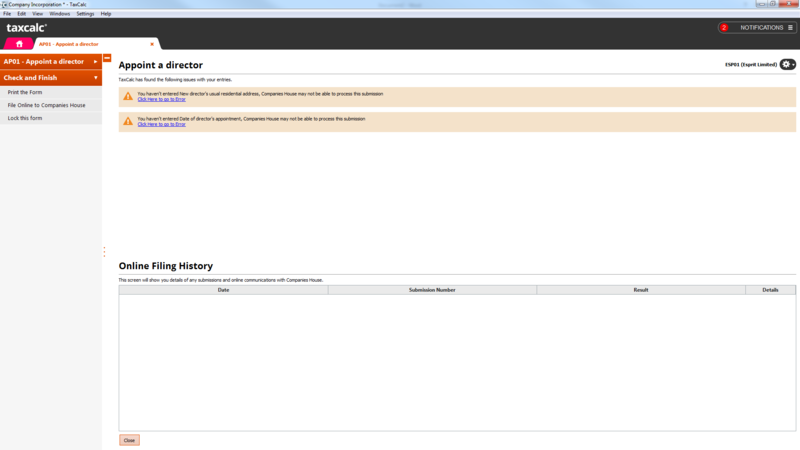 install TaxCalc Companies House Forms onto? TaxCalc Companies House Forms may be installed on a single computer if you have chosen to use the standalone version. For network and cloud customers, there is no limit, although the number of concurrent users will be limited by the licence you purchased.. Please select from the options below to build your TaxCalc Companies House Forms order. Prepare and file unlimited Companies House forms during your twelve month licence period. Also includes Companies House Advanced Integration for quickly on-boarding Limited Company clients and keeping company data up to date and accurate. Prepare and file Companies House Forms for up to 50 clients during your twelve month licence period. Prepare and file Companies House Forms for up to 12 clients during your twelve month licence period. Password protect exported tax returns for emailing to your clients. Note that this add-on is only available for Windows users.